Doctors Sutomo whose real name was born in the village Subroto Ngepeh, East Java, July 30, 1888. 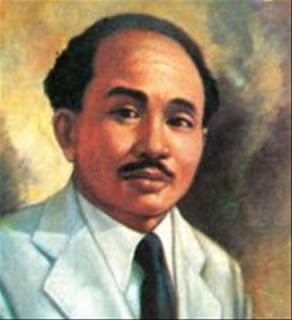 While studying at STOVIA (medical school), he and his colleagues, on the advice of dr. Wahidin Sudirohusodo establish Budi Utomo (BU), the first modern organization in Indonesia, on May 20, 1908, which was later celebrated as the Day of National Awakening. Birth of BU as the National Society of Indonesia, spearheaded by the young students STOVIA (School voor Indische Artsen Opleiding tot) is Sutomo, Gunawan, Suraji assisted by Suwardi Surjaningrat, Saleh, Gumbreg, and others. Sutomo himself appointed as its chairman. Purpose of this association is the advancement of a harmonious homeland by way of promoting teaching, agriculture, animal husbandry, commerce, engineering and industry, culture, enhance the ideals of humanity to achieve the life of a respectable nation. Then Congress inauguration and adoption statutes BU held in Yogyakarta October 5, 1908. The first Board consisted of: Tirtokusumo (regent Karanganyar) as chairman; Wahidin Sudirohusodo (doctors Java), deputy chairman; Dwijosewoyo and Sosrosugondo (both teachers Kweekschool), writer; Gondoatmodjo (Legion officer Pakualaman), treasurer; Suryodiputro (chief prosecutor Bondowoso ), Gondosubroto (Surakarta chief prosecutor), and Tjipto Mangunkusumo (doctors in Demak) as commissioner. Sutomo after graduating from STOVIA 1911, served as a physician, first in Semarang, and then moved to Tuban, moved again to Lubuk Pakam (East Sumatra) and finally to Malang. While serving in Malang, he eradicate bubonic plague that hit the area Magetan. normal; line-height: normal He gained a lot of experience where the task of frequent movement. Among other things, he is more and more aware of the people and directly misery may help them. As a doctor, he does not set rates, even sometimes patients exempted from payment . Then he had the opportunity to deepen their knowledge in the Netherlands in 1919. Back in the homeland, he saw weaknesses in Budi Utomo. At that time, many established political parties. Because of that, he took it that Budi Utomo actively engaged in politics, and membership is open for all people. Later in 1924, he founded Indonesische Study Club (ISC), which is a forum for Indonesian intellectuals. ISC successfully established weaving schools, banks, credit cooperatives, and so on. In 1931 ISC renamed the United Nations Indonesia (PBI). Under his leadership, PBI growing rapidly. Meanwhile, the pressure of the Dutch national movement toward tougher. Then in January 1934, the Commission for BU-PBI, which was then approved by both the board-size mid-1935 to fuse. Congress inauguration fusion and also the last congress BU, childbirth Great Indonesia Party or abbreviated Parindra, lasts 24 to 26 December 1935. Sutomo appointed as chairman. Parindra struggle to reach Indonesia's independence. Besides dealing in politics and medicine, dr. Sutomo also active in the field of journalism. He even led a few pieces of paper. In the age of 50, he died in Surabaya on May 30, 1938.